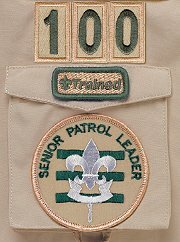 The BSA has uniform inspection sheets available for the centennial uniforms now. The main difference is a mention about placement of patches on the sleeve pocket. But, all the inspection sheets have been updated and a couple new ones created. There are now sheets for Cub Scout, Webelos, Boy Scout, and Adult Leader. So, the unit number is directly above the left sleeve pocket flap? I can't see this on the inspection sheet.....am I missing the directions? Where does the jamboree patch go? Above the right pocket or below the Council patch on the the left sleeve?